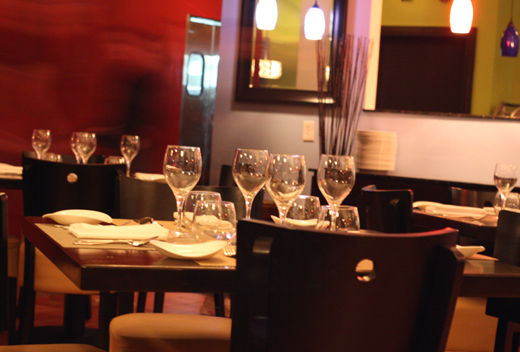 You don’t expect to find a glam, contemporary Indian restaurant in a strip mall off El Camino Real in Sunnyvale. But Arka, named for the sun, has risen in what was once a Spoons coffee shop. 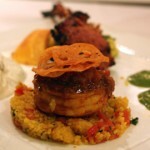 Opened just six weeks ago, Arka serves up the flavors of various regions throughout India, but particularly the south. Step inside and you’re immediately transported to somewhere besides the congested thoroughfare right outside the door. Jewel colors of crimson, gold, eggplant and lime green offer a warm welcome, along with some of the snazziest light fixtures around, including drum lights that hide a cityscape of New York. How cool is that? A lunch menu is offered daily. But dinner is where you can really sit back and enjoy. That definitely means indulging in some of the fun bar offerings, including beer flights ($9 each), and a farmers’ market cocktail ($8) blended with seasonal fruit and herbs. Last week, I was invited to be a guest of the restaurant. If the vibe and menu harken to other contemporary Indian restaurants such as Sakoon in Mountain View and Amber India locales in San Francisco and the South Bay, it’s understandable. After all, Arka General Manager Michael Agnel was the former operations manager for Sakoon. 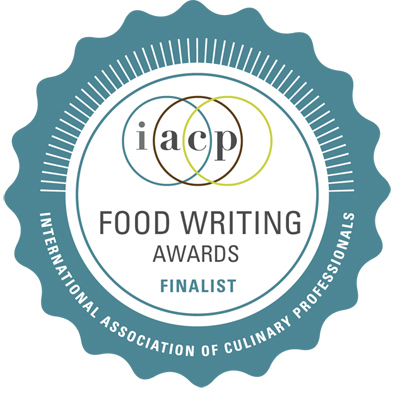 And Arka Consulting Chef Sachin Chopra was formerly with Amber India, then Sakoon, before opening his own restaurant, All Spice in San Mateo. The menu is helpfully labeled with symbols to indicate dishes that are gluten free, vegan, and “without onions and garlic” for Hindus who abstain from those aromatics. My friend Joanne and I started with what turned out to be one of our favorite dishes of the evening: “His Majesty’s Chilli Chicken” ($7.95). 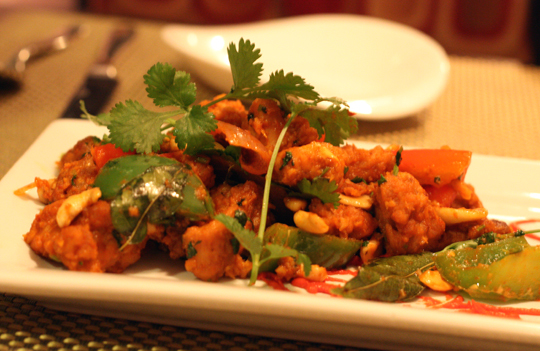 Cubes of tender chicken breast are stir-fried with curry leaves, green chiles and cashew halves. You can’t eat just one. There’s a touch of sweetness from tomatoes and just enough heat to make your taste buds sit up and take notice. Like all the dishes we tried that night, the heat level was balanced, rather than scorching. 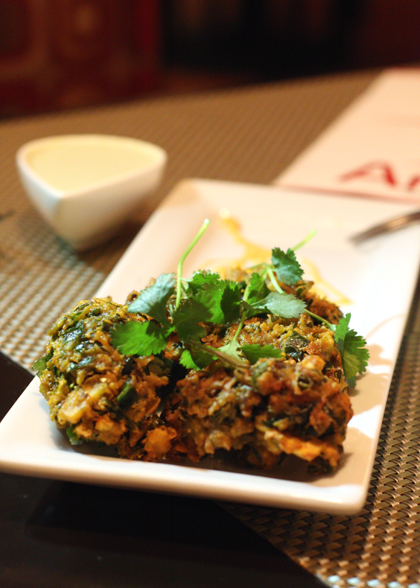 Pakora get an unusual treatment here. They’re made of spinach and plaintains ($5.95), an ingredient you never find on Indian menus. The plump fried balls were quite crisp and came with coconut and tamarind chutneys for dipping. 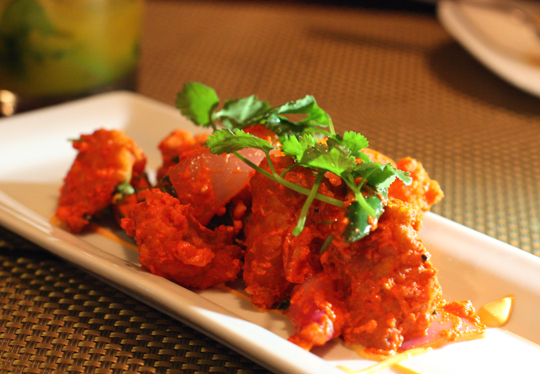 “Macchi Sambhariya” ($7.95) brought bite-size cubes of fish, which had been marinated in yogurt, coriander and red chili masala, before being fried. 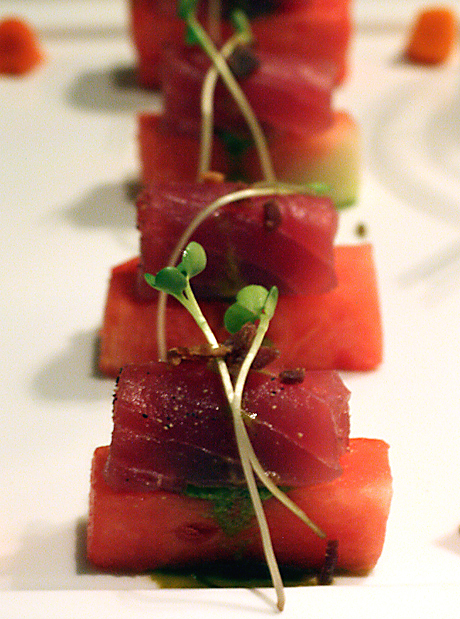 The red-hued cubes had nice flavor, but the fish was a tad spongy. 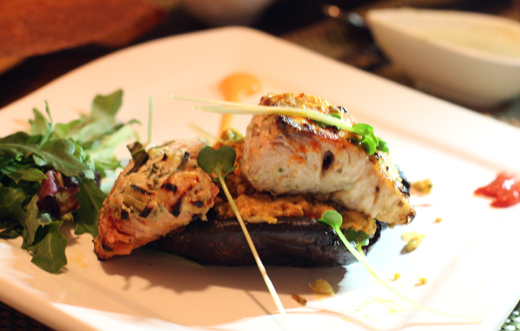 Again, fish suffered a little in the tandoori mahi mahi ($17.95). Fragrant with lemongrass and kaffir lime, the fish was cooked just a little longer than I would have liked, leaving it a little dense in texture. It was served dramatically over a roasted whole portobello. 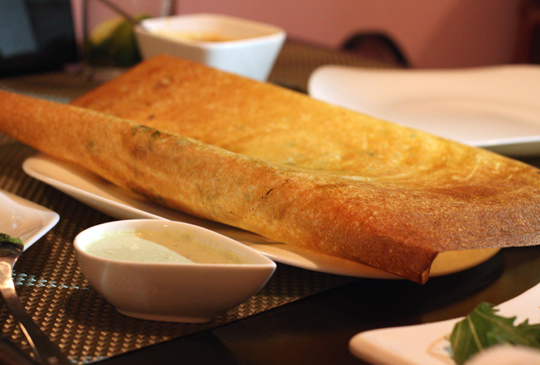 Arka offers a range of dosas, including a wonderful pumpkin one ($7.95). The massive rice and lentil crepe hides a filling of pumpkin cubes that taste almost candied. It’s perfect with one of the spicy chutneys smeared on it. 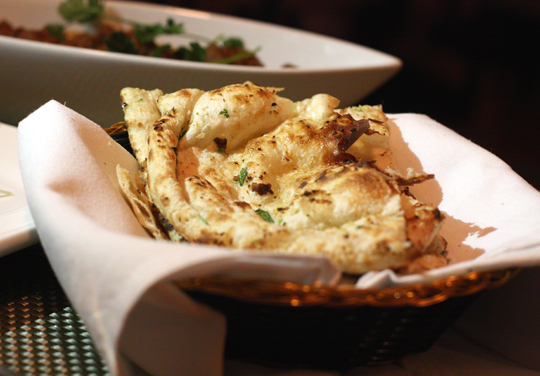 The naan is also wonderful. Although some unusual ones are offered, including a pesto-parmesan one, we stuck with a more traditional “Garlic Chili Naan” ($2.45). Serranos offered a modest amount of heat in what was akin to a thinner, fluffier cousin of garlic bread — and every bit as irresistible. 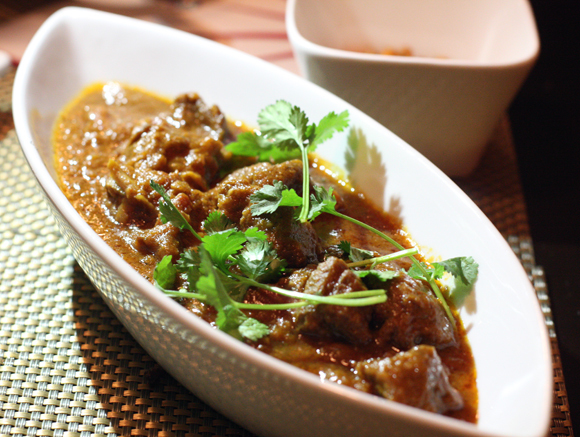 “Nizami Goat Curry” ($15.95) will make goat fans out of even those who don’t think they are. Bone-in cubes of tender meat, almost lamb-like in taste and texture, are cooked slow in a thick, caramelized onion sauce that you’ll surely want that naan to lap up. For dessert, we shared the lychee keer ($5.95), a rice pudding with a bruleed top and Asian tropical sweetness from lychees. A small dollop of whipped cream and a squiggle of chocolate — unnecessary garnishes — sat by themselves off to one side of the plate. 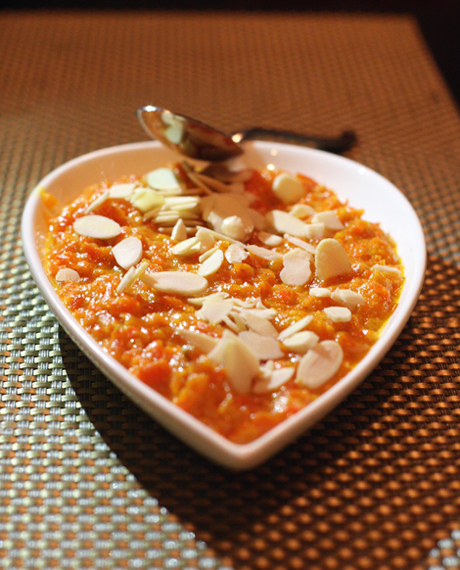 You’ll tell yourself that the carrot payasm ($5.95) will improve your eyesight to justify eating this ghee-rich dessert. Or you’ll just plow ahead anyway like we did because the stewed shredded carrots cooked with just enough green chiles to add a fruity depth is so wonderfully satisfying. 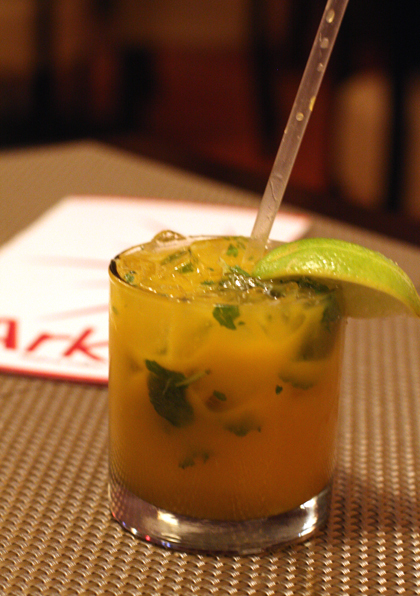 Arka is a welcome addition, making this stretch of El Camino shine a whole lot brighter. Nice meal! The naans look amazing. What an interesting array of Indian dishes (although I think someone in the kitchen went a little to crazy with the cilantro garnishes). I’m not a fan of Indian food because I agree that sometimes tandoori can be a bit overcooked, drying out the protein, or the curry can be too mushy. 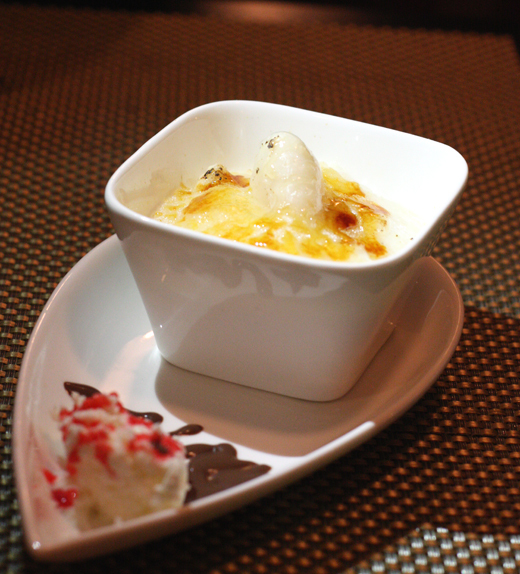 But it’s nice to discover other Indian stables like that carrot dessert! That sounds interesting. And I do love any of the naans or dosas. 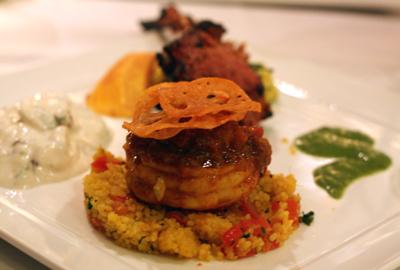 Actually, I think Indian cuisine shines better when focused on the street food, and not plated bigger dishes. And those lamp shades are so darned cute! 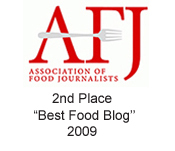 I’m eternally a fan of really good, inventive indian food. This would SO hit the spot. Great review and write up! The menu sounds fantastic and love that they have symbols to guide the dinner through the dishes. Everything looks delightful! 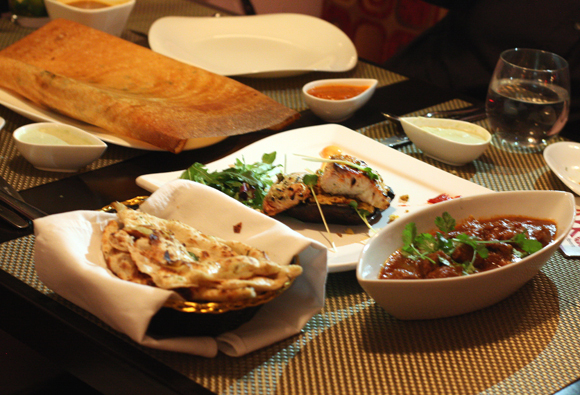 I love south Indian food especially the curries. Pity about the fish although it is definitely rare for an Indian restaurant in Sydney to feature tandoori together with the spicier dishes of the south. 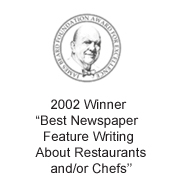 Thanks for writing up this restaurant. This location hasn’t had much luck since Spoons left, possibly since the interim restaurants seemed to want to do it on the cheap. I greatly hope that the amount of TLC that has been invested will pay off big and grace Sunnyvale with a gem it can be proud of. Looks like a great restaurant! I am planning to try it out this weekend. Definitely curious to see what their beer flights are and how they chose to do their pairings. 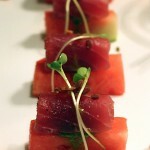 If not for your post I would not have known about Arka..it looks divine. I will try it soon! 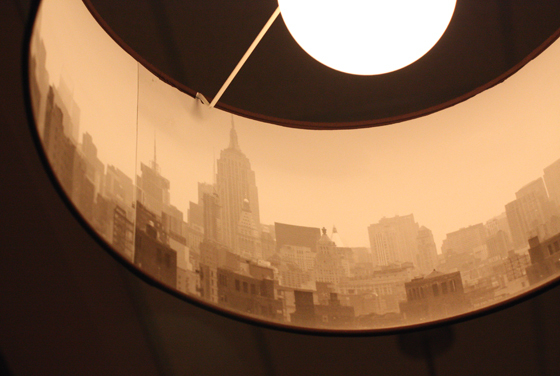 However, I found my way to your post as I am searching for the drum shade with the New York City skyline. This is exactly the one I’m looking for to use in my home. Where in the restaurant is this hanging?